In 1970 Curtis Mayfield left The Impressions to embark on his own solo career and what followed was a highly creative, rich and celebrated path in which Mayfield produced some of the most influential R&B, soul, funk and gospel recordings of all time. In 1973 he released Back to the World, the album which followed in the footsteps of his acclaimed Superfly LP. This record proved to be equally as powerful, peaking at number 16 on the Billboard 200 chart as well as hitting number 1 on the Top R&B/Hip-Hop Albums chart! 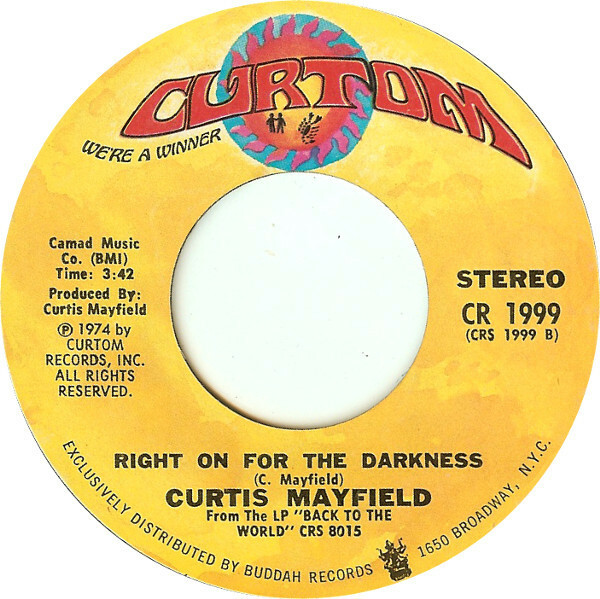 Right On for the Darkness features on this album and was also released as the b-side to his Kung Fu track on Curtom Records (a label Curtis Mayfield founded in 1968 with Impressions manager, Eddie Thomas with the label’s name being a combination of Mayfield’s first name and Thomas’ last name). Check it out above. This entry was posted in Funk, Soul and tagged Curtom Records, Funk, Soul. Bookmark the permalink.